In keeping with the “cars you don’t see anymore” theme, this week, it’s about cars you don’t see unmolested – or completely rusted out. These tend to be Japanese. I had no clue after growing up in California, which has been in a drought for most of my life, that Japanese cars from even the mid-1990s are now pretty rusty things in parts of the country. I lived in Boston for two years and I don’t think I ever saw a pre-1990s Honda Accord, for example. Tragic. It’s probably safe to say many of the un-furious Integras left are not hot GS-Rs or Type Rs, but more humble LS models with autoboxes. If Acura kept going with the Integra/RSX line, it would’ve been ahead of the curve with these so-called premium compacts now being touted as “the next greatest thing” by all of the big luxury brands. It was also made before the current soft and squishy Honda era, so even the base cars are nice pieces. 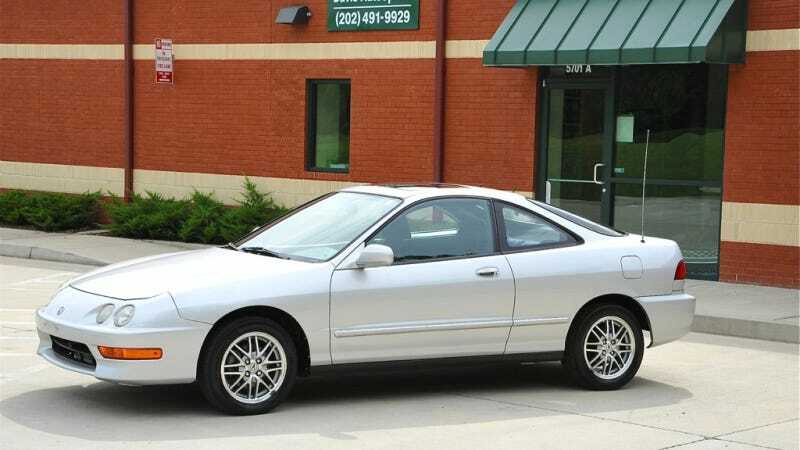 That’s why every example like this 2000 Acura Integra LS hatch pops up with 5-digit mileage and (usually) an auto and tacky cloth upholstery, I look at it with an unusual piece of admiration. It’s barely a decade old and it still creates a ton of nostalgia for people, or a load of ‘90s sentimentality at least. It's the little touches that make the Integra endearing, though. It's a modern car, no doubt, but the engine isn't covered in plastic – it's a Honda Mess, if you will. The upholstery might be odd, but the controls and layout are brilliant. The Integra is likely a future classic, but it’s not a classic yet and it doesn’t quite get enough people going up to it and going, “Oh, I remember these,” especially in non-descript LS trim. Buy it and maybe hold on to it. Who knows what’ll happen in 10 years. What will probably generate more attention is something conjuring up images of the 1970s/early ‘80s, like this 1981 Toyota Celica. The second-generation Celica was the last that seemed to embrace this Japanese interpretation of American design, demonstrated by the pony car-like styling that reminds me a bit of the Mazda RX-4 featured here a few weeks ago. The American-ness continues inside with a color-coordinated interior with a wood-like dashboard. This Celica is almost 20 years older than the Integra and it shows it on the inside. There's that automatic, again, but at least it's also a four-speed like the Acura's – which helps when there's something like 100 horsepower on this thing. Clearly, it was owned by someone who didn't crave speed or fast cornering but instead chose to lovingly preserve it in California with just 71,000 miles. I don't think this Celica was ever in danger of being modified to no end, but instead abused until it finally became disposable. It's how I remember them, anyway – brown and dented. To see one like this is a refreshing change. I'm a sucker for Integras, but I'm holding out hope there's a very nice and tidy GS-R out there somewhere and I'll be in the right place at the right time to buy it and enjoy it. This Celica ST automatic, dated as it looks and probably as slow as it sounds, is just charming. I don't know, it just makes me smile.